In the past CES technology event, held in January this year 2017 saw what would be the new HDMI 2.1, which promises to take our multimedia experience to a new level like never before. The new HDMI 2.1 standard left everyone open-mouthed because of the great possibilities it brings to interact with audiovisual content. And the moment arrived, after several months of twists and turns, the availability of HDMI 2.1 was announced a few hours ago. So soon we will see it integrated into the most modern TVs, Laptops, PCs and video game consoles on the market. In fact, it was saying in many technology agencies and magazines that one of those who would take the honor of being the first to incorporate it would be the Xbox One X, something that did not happen at the end. So in the next CES of 2018 if we can marvel at this breakthrough HDMI 2.1 on almost all the most modern devices. Yes, as you’ve read it, it’s no joke. HDMI 2.1 breaks all the multimedia transmission speed records you’ve ever dreamed of. 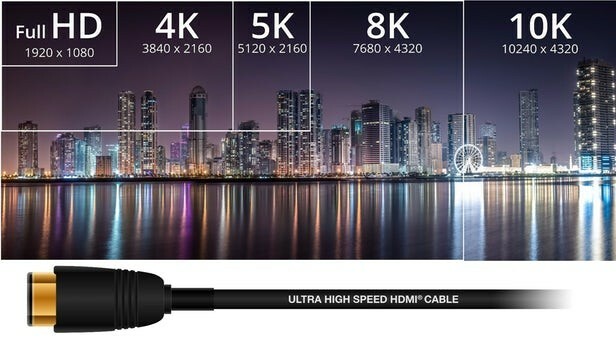 Unlike its HDMI 2.0 predecessor, HDMI 2.1 offers bandwidth speeds of up to 48 Gbps, which will allow it to transmit video at a 10k quality, more than twice the current 4k. So you know, if you want to watch TV at 10k you need one that supports it first, and second, you’ll need an HDMI 48G cable. The good thing about this cable is that it will also be compatible with other previous versions of HDMI, such as 2.0. But as the multimedia man of the XXI century lives not only in speed, we also find that he has improved a lot in terms of 60Hz rates that will be used for 8k resolutions, and 120H for 4k resolutions. It also incorporates the Dynamic HD in all resolutions supported by the device, in addition to Variable Refresh Rate (in English VVR) compatibility so that the refresh in our device is automatic.